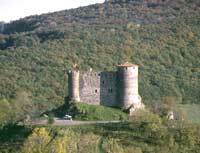 Built by Guillaume VIII of Auvergne to Xllle century, the castle of Busséol is one of the rare Romance fortresses remained intact. It is drawn up on a volcanic piton with 650 meters of altitude and preserved a court-garden, as well as an interior decoration evoking the Average Age. The castle belonged to several significant characters, of which Catherine de Médicis. Presentation of a splendid Romance chimney with cylindrical, single hearth in a castle in France.